Barbara H. Bengtsen O'Leary was born January 5, 1932 in Minneapolis, MN to Ralph L. and Blanche R (nee Racey) Andreas. 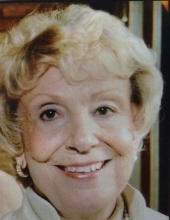 she died October 13, 2018 at Northwest Community Hospital in Arlington Heights. Barbara is survived by her husband Franklin A. “Frank” O’Leary; her children David (late Mary) Hartman, Lynn (Phil) Bengtsen, Laura (Kurt) Daniel, and Cherrie Hartman; her step son Paul Bengtsen; her grandchildren Lindsey (Ryan), Christopher, Erik (Tina), Andrew, Tyler, Samantha, Sara, Jake, Ava, Casey (Dave) Cory, Paige (Grant); her great grandchildren Ainsley, Declan, Lionel and Beckett. Barbara is preceded in death by husbands David E. Hartman and Ralph Bengtsen; her sons Dean Hartman and Daniel Hartman; her brothers Ralph (Charlotte) Andreas Jr. and James (Martha) Andreas and by her parents. Visitation Friday, October 19, 2018 from 4 PM until 7 PM at Glueckert Funeral Home Ltd., 1520 N. Arlington Heights Road, Arlington Heights (4 blocks south of Palatine Road). Funeral service 11:00 AM Saturday, October 20, 2018 at Glueckert Funeral Home. Interment Memory Gardens Cemetery. "Email Address" would like to share the life celebration of Barbara Hartman Bengtsen O'Leary. Click on the "link" to go to share a favorite memory or leave a condolence message for the family.